Cops and Robbers Fruit Machine Guide & Review - Casino Answers! Cops and Robbers is a 3-reel, 1-line, 1-coin AWP fruit machine from Microgaming. It has nudge and hold features, a bonus game and additional fruit machine features. 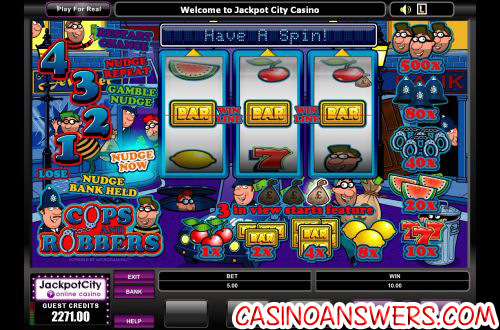 Cops and Robbers can be played at any Microgaming casino, which includes Jackpot City Casino and All Jackpots Casino. Cops and Robbers is not an ordinary slot machine. It’s a fruit machine, also known as a one-armed bandit, pub slot or AWP (Amusement with Prizes). These are special slot machines with features such as “hold” (holding one or two reels at their previous spot, while spinning the remaining reels) “nudge” (moving the reel down slightly after a spin). Bets available in Cops and Robbers are $0.10, $0.20, $0.25, $0.50, $1, $2, $5 or $10. Payouts are 1X for 3 cherries, 2X for 3 bars, 4X for 3 double bars, 8X for 3 lemons, 10X for 3 7s, 20X for 3 watermelons, 40X for 3 handcuffs, 80X for 3 bobby hats and 500X for 3 robbers. Cops and Robbers has a hold feature. This randomly played and it will offer to hold up to 2 reels for you in the same position for the next spin. Also played randomly is the nudge feature. This will bump a reel down to the next symbol. You can win up to four nudges. You can also bank, repeat and gamble your nudges. Cops and Robbers has a special Getaway Feature. This is randomly triggered during the game and enables the game to automatically spin a winning combination. Another randomly triggered special feature in Cops and Robbers is Let ’em Spin. If two identical symbols come up on a payline after you have used all of your nudges, Let ’em Spin will pop up in your information window. Spin the reels without holding any and you will be guaranteed a winning combination. Finally, there is the Hold This Reel Feature. When Hold This Reel is activated, one symbol on the reels will shake to indicate that you should hold this reel only. Hold the reel and click the Spin button. The game automatically spins in the two matching symbols to complete a winning combination. You can win up to 200X your bet in Cops and Robbers’ Chaser Trail bonus game. The bonus game will be triggered when you hit three swag bag symbols. Chaser Trail is essentially a simple board game. You play a robber who is being chased by a cop. You must spin the bonus reel and make your way down the trail. For each move you make, the cop will make a move as well. If the cop catches up to you, the game will end and you will not win any prizes. When you land on a place on the trail, you may choose to Collect the prize or spin the reel again. The more you spin, the bigger the prizes will get. The Cops and Robbers fruit machine is a lot of fun. If you’ve never tried a fruit machine before and want to see what they’re all about, Cops and Robbers is a great choice for one to start with. If you’ve played many a pub slot in the past, much like myself, you’ll also enjoy Cops and Robbers. To get a great bonus to play Cops and Robbers with, sign up and deposit at Jackpot City Casino. Where can I find more information on AWPs/fruit machines/pub slots? If you want to learn more about this variation of slot machine, you can read our Fire ‘N’ Dice fruit machine review. Does the Cops and Robbers pub slot have a progressive jackpot? The Cops and Robbers AWP does not have a progressive jackpot. If you’re looking for a progressive jackpot, Jackpot City Casino. has tons of other slot machines with progressive jackpots, including CashSplash, Fruit Fiesta, King Cashalot, LotsaLoot, Major Millions, Mega Moolah, Mega Moolah 5 Reel Drive, Mega Moolah Isis, Mega Moolah Summertime, Treasure Nile, Tunzamunni and Wowpot. Can I find a US-friendly casino offering Cops and Robbers? Unfortunately, no US-friendly online casino currently has Cops and Robbers available. For a great selection of USA-friendly slot games, please visit Bovada. Is there a cops and robbers slot game?